Interstate 255 & U.S. 50 span the Mississippi River west from the American Bottoms area north of Columbia, Illinois to unincorporated Mehlville, Missouri. 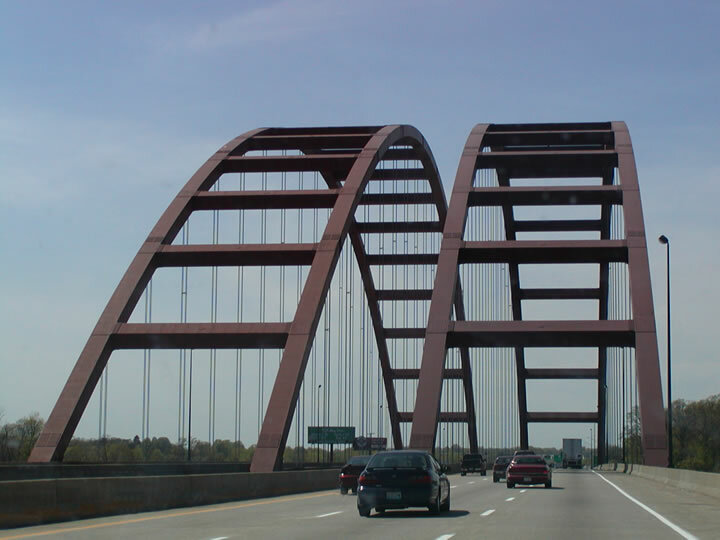 The tied arch bridges are named after the adjacent Jefferson Barracks National Cemetery. Photo taken by Joel Wade (04/16/05). Forming the eastern third of a beltway around the metropolitan St. Louis, Interstate 255 provides a bypass route for I-55 and I-70 traffic. The freeway angles east from Mehlville, Missouri across the Jefferson Barracks Bridge over the Mississippi River to Columbia, Illinois. Illinois 3 ties into I-255 there as an expressway north from Waterloo. The two overlap north to Dupo before separating on respective courses north to Cahokia and northeast to Alorton. Interstate 255 serves as a commuter route northward by St. Louis Downtown Airport (CPS) to I-64 at Caseyville and Interstates 55-70 at Collinsville. U.S. 50 accompanies the freeway north from I-270 in Mehlville to I-64 east to O&apos;Fallon. Beyond Collinsville, I-255 turns north to Pontoon Beach and a rural junction with I-270 and Illinois 255 north to Godfrey. Illinois 3 north at the three-wye interchange with Interstate 255 in the city of Columbia. Note that Interstate 255 is signed north-south in Illinois, while it is signed east-west in Missouri. Photo taken by Joel Wade (04/16/05). 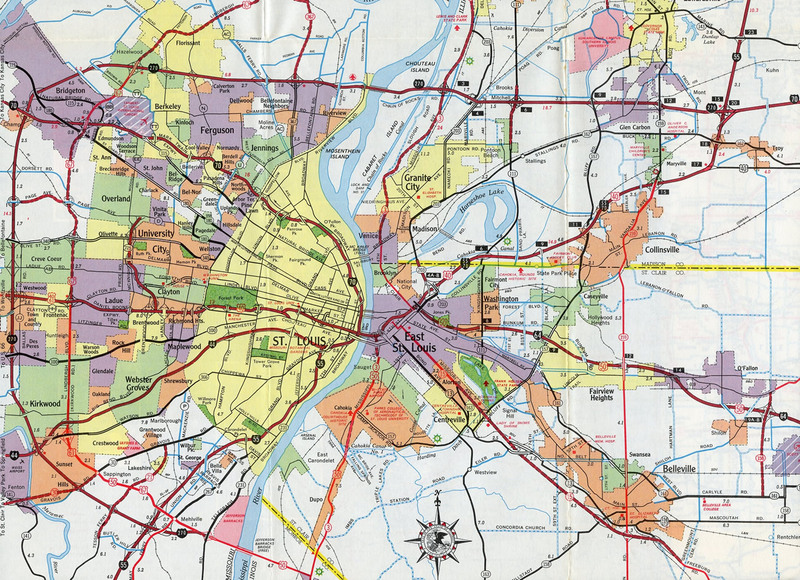 Changes made to the St. Louis area numbered route system in 1974 included the relocation of U.S. 50 over what was previously designated as U.S. 50 Bypass, from Sunset Hills, Missouri to Fairview Heights, Illinois. The elimination of U.S. 50 Bypass coincided with the relocation of the U.S. 50 mainline onto I-255 from Illinois 3 south of Cahokia to Lindbergh Boulevard at Mehlville. Also approved by AASHTO on June 25, 1974 was the renumbering of both Interstates 244 and 255 as an extended I-270. 1977 Illinois Official Highway Map showing the small portion of Interstate 255 opened at the time as I-270. Since the freeway was constructed with state funds, it is not a candidate for Interstate status. However, that also depends upon whether an Interstate-grade facility is constructed along U.S. 67, as some Western Illinois politicians have wanted for years. MODOT replaced signs throughout the Saint Louis region from winter 2000 to 2002 with newer style retroreflective sign panels. By late 2001, the Interstates 255 and 270 in Missouri was dedicated the “American Veterans Memorial Highway”. Interstate 255 bends northwest through eastern reaches of Pontoon Beach to Illinois 162 and Interstate 270. Photo taken 05/24/18. Traversing flat agricultural areas along I-255 north, one mile ahead of the transition to IL 255 at Interstate 270. Photo taken 05/24/18. Advancing north with four lanes, a lane drop occurs in one quarter mile for Exit 30 and Interstate 270. Photo taken 05/24/18. Exit 30 expands to two lanes for I-270 west to Granite City and the Chain of Rocks Bridge and I-270 east to Glen Carbon and Effingham. Photo taken 05/24/18. A two-lane flyover connects with Interstate 270 west. The St. Louis bypass meets I-70 at Bridgeton in 22 miles. Photo taken 05/24/18. Crossing over Gateway Commerce Center Drive, the IL 255 freeway advances one mile south to the directional cloverleaf interchange with I-270 and I-255 south. Photo taken 05/24/18. A number of distributor centers are located north of the upcoming exchange with Interstate 270. 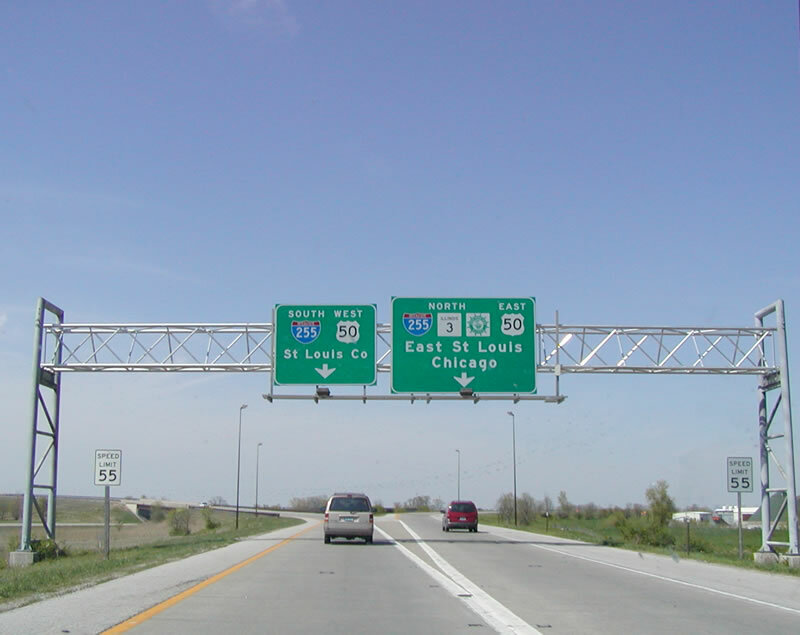 The IL 255 exit numbering sequence concludes with I-270 assigned Exit 30 for I-255. Photo taken 05/24/18. A collector distributor roadway partitions for I-270 west toward Kansas City and east toward Indianapolis as IL 255 transitions into I-255 south. Photo taken 05/24/18. The ramp for Interstate 270 west to Bridgeton, Missouri departs from the c/d roadway at Exit 30. Kansas City lies 241 miles to the west via I-270 and I-70. Photo taken 05/24/18. Interstate 270 merges with I-70 east near Troy in 7.8 miles. The capital city of Indiana is a 221 mile drive from IL 255 / I-255. Photo taken 05/24/18. 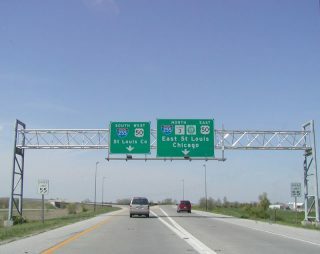 Interstate 270 progresses 0.75 miles east from the cloverleaf interchange (Exit 6) with IL 111 in north Pontoon Beach to I-255 south and IL 255 north. Photo taken 05/03/12. A collector distributor roadway shifts movements for I-255 south to Collinsville and IL 255 north to Alton away from the freeway mainline at Exit 7. Photo taken 05/03/12. Interstate 255 bypasses the east side of the St. Louis metro area to Mehlville and I-55 south to Memphis, Tennessee. Photo taken 05/03/12. Exit 7B departs from I-270 west for the IL 255 north. IL 255 extends 20.4 miles north from I-255 as a freeway to Alton and U.S. 67 north of Godfrey. Photo taken 05/03/12. A loop ramp follows for Interstate 255 south to Caseyville, East St. Louis and Cahokia. Photo taken 05/03/12. U.S. 50 (Lindbergh Boulevard) separates from Interstate 255 west to join the freeway with U.S. 61 and 67 through Mehlville. I-255 passes by South County Center mall to meet Interstates 70 and 255 over the next mile. Photo taken by Rich Piehl (12/00). A loop ramp from U.S. 61 (Lemay Ferry Road) adds an auxiliary lane to Interstate 255 west to Exits 1A for Interstate 55 south. Exit 1B leads motorists 12 miles north along I-55 to Downtown St. Louis. Photo taken 05/03/12. Entering the cloverstack interchange (Exits 1B/A) with Interstate 55 on I-255 west. I-55 winds 22 miles through the south suburbs to Festus. Crossing the River Des Peres Drainage Channel, I-55 north enters the Patch neighborhood of St. Louis in five miles. Photo taken 05/03/12. Interstate 270 advances east from Missouri 21 through the Concord community to end at I-255. MODOT typically signs the ends of Interstates and other major freeways with this style of sign. Photo taken by Rich Piehl (12/00). A collector distributor roadway separates movements from the I-270 / 255 eastbound main line for I-55 south to Festus, I-55 north to St. Louis and the nearby commercial stretch of U.S. 61 & 67 (Lemay Ferry Road). Photo taken 12/20/09. Three lanes continue east onto Interstate 255 toward the Jefferson Barracks Bridge and Columbia, Illinois the Exit 1A c/d roadway partitions for I-55 south to Memphis and north to Lemay and the Poplar Street Bridge across the Mississippi River. Photo taken 12/20/09. Ramps from I-55 north and south combined below the eastbound c/d roadway for I-255 to merge with the freeway mainline just prior to Exit 1B for U.S. 61 & 67 (Lemay Ferry Road). Photo taken by Brian Dowd (06/02). Interstate 55 ultimately expands to six northbound lanes to Exits 196A/B for I-255 / I-270 at Mehlville. Photo taken by Brian Dowd (10/12/02). Interstate 55 runs just west of adjacent U.S. 61 & 67 (Lemay Ferry Road) to the departure of Exit 196 for I-270 north to Bridgeton and I-255 east to Collinsville, Illinois. Photo taken by Brian Dowd (10/12/02). Passing under Mattis Road, motorists headed for the St. Louis beltway separate from Interstate 55 north in one quarter mile. I-270 north to I-70 west leads travelers 241 miles to Kansas City. Photo taken by Brian Dowd (10/12/02). Interstate 55 advances north with four through lanes toward St. Louis as Exit 196 parts ways for the St. Louis beltway. Ramps for I-270 west (north) and I-255 east were previously assigned as Exits 196A/B respectively. This change was made at the request of the planning commission, but subsequently changed back. Photo taken by Brian Dowd (10/12/02). The ramp separation for Exit 196. I-270 encircles the west suburbs north through Maryland Heights and the north suburbs east to the Chain of Rocks Bridge. I-255 combines with U.S. 50 nearby to cross the Jefferson Barracks Bridge into Monroe County, Illinois. Photo taken by Brian Dowd (10/12/02). Interstate 55 southbound approaching the junction with Interstate 255/270 and U.S. 50/61/67. Photo taken by Rich Piehl (12/00). July 26, 1988 – A ceremony on I-255 north of Granite City marked the completion of the Interstate loop around St. Louis, Construction on the Missouri side began in 1962, and was finished by 1969. The 38-mile Missouri loop was divided into I-270, 244 and 255. In 1974, officials considered naming the whole thing after John F. Kennedy, then decided to designate it as 270 on the Missouri side, 255 in Illinois. [Facebook update]. Retrieved from https://www.facebook.com/513201722060059/photos/pcb.1491604140886474/1491602664219955/?type=3&theater. "Jefferson Barracks Bridge Opens…Crowd Braves Harsh Wind To Watch Span&apos;s Dedication." St. Louis Post-Dispatch (MO), December 4, 1990. "One-Mile Piece of I-255 Will Open Today." St. Louis Post-Dispatch (MO), March 15, 1988. "Metro East area is in the loop – 21-mile, four-lane freeway will arc from I-270 and link to U.S. 67 near Godfrey." St. Louis Post-Dispatch (MO), July 14, 2010. "Illinois 255 extends its reach to Godfrey." Edwardsville Intelligencer, August 26, 2008. "Illinois 255 opens to Godfrey ‘Y’." The Telegraph (Alton, IL), November 22, 2012. "Routes 67 and 255 Come Together." Alton Daily News.com, July 19, 2013.